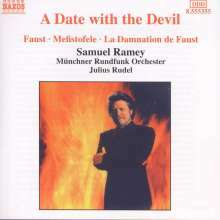 Der Artikel Samuel Ramey - A Date with the Devil wurde in den Warenkorb gelegt. A. Beaujean in stereoplay 11 / 02: "Dieser Teufel bleibt sich immer gleich und singt stets machtvoll-opulent und prächtig drauflos." Hörprobe Track 9: Les contes d'Hoffmann (The Tales of Hoffmann): Les Contes d'Hoffmann (The Tales of Hoffman): Scintille, diamant! Samuel Ramey: Les contes d'Hoffmann (The Tales of Hoffmann): Les Contes d'Hoffmann (The Tales of Hoffman): Scintille, diamant! Hörprobe Track 10: Faust : Le veau d'or est toujours debout! Samuel Ramey: Faust : Le veau d'or est toujours debout! Hörprobe Track 12: The Rake's Progress: I was never saner. Samuel Ramey: The Rake's Progress: I was never saner. Hörprobe Track 13: The Rake's Progress: I burn! I freeze! 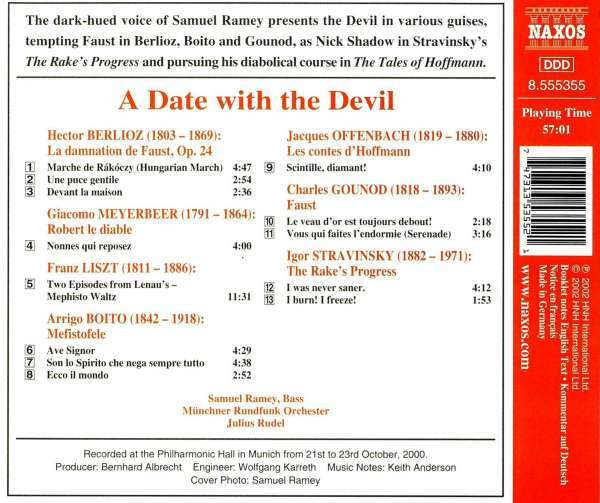 Samuel Ramey: The Rake's Progress: I burn! I freeze!